Short way of expressing my admiration: Cor! Slightly longer: A stunning masterpiece. Congratulations, Alan. The 'Baby Scot' is a masterpiece. My preference is normally for pre-1948 liveries, but I think that the post-1956 'British Racing Green' looks absolutely terrific on this engine. Thank you so much for all the photographs of your restoration and rebuild of 45511. I very much look forward to seeing progress with the 'B12/3'. Not my area but lovely work Alan. Hi Dr Al, First off have to echo what others have said, just stunning, hard to believe at times it is N and not OO - the most impressive for me is the pipework on the Ivatt class4. Neither. I cobbled them together from various offcuts of Fox Transfers wagon sheets - they had the word Trestrol, MB was from individual cut out letters as was the numbering. I tend to use these sheets to get the most out of them, as buying individual sheets correct for each wagon is either not possible (in this case) or simply prohibitively expensive. Not the Patriot is complete, more progress has been made on the B12. The tender has been mostly completed, with vac pipes, coupling hook and front handrails fitted. All handrails have been straightened up and adjusted. Also repaired was a divet thoughtfully taken out of the tender side by a previous owner - this was filled with low melt solder and filed back. Tender now just needs checking as to whether it had a brake wheel in the cab, and then it should be pretty much done. 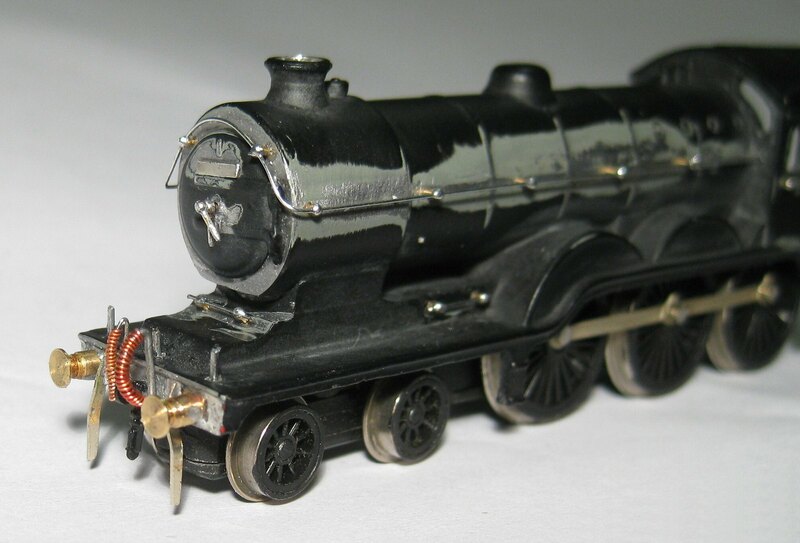 Loco has had front end detail completed with lamp irons, smokebox door dart and BR numberplate fitted. All the handrails also been straightened out. Only now need to figure how to do the vertical cab handrails as there's not much space there. This is getting close - a few more cleanups, a few wiggly small pipes to add once exact prototype is chose (as they seemed to be a little varied) and decide wherther to replace the Westinghouse pump, or just detail it. This will definitely be lined out in full BR black - while some B12s were unlined black (and thus the UM model is correct), I think this will pop much more with full mixed traffic lining. We'll need to see how the stoneguard survive - they will be vulnerable, particularly to derailments. After removing the Westinghouse brake gear (will be replace with separates) and fitting the cab handrails, the first covering of primer applied. I did not strip the body further than above - the UM primer is decent and holds well so retaining the base finish everywhere apart from where changes made is desirable. Westinghouse parts still need fitting, but I wanted to see how clean the removal looked, hence primer - seems ok. A variety of small dings, bumps and other bits that will need cleaned up, but not bad for first pass. Didn't realise UM had made the smaller GER tender replacing the group standard this originally came with. 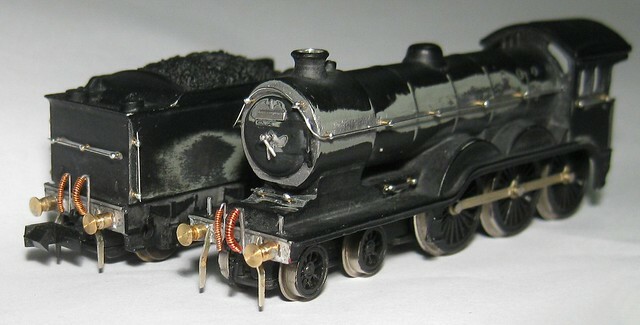 My B12 has a BHE tender with a much modified continental chassis which has never been up to much. 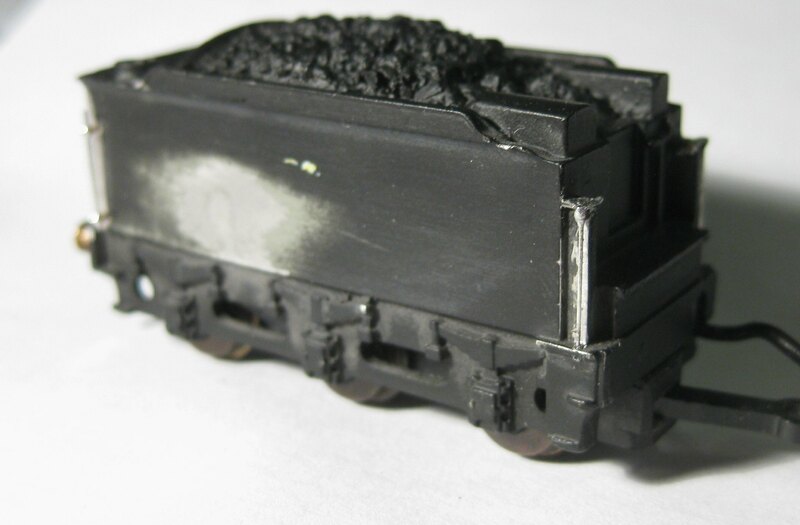 It came along with the release of the D16s - UM have started to diversify their tenders and drive chassis wheelbase. 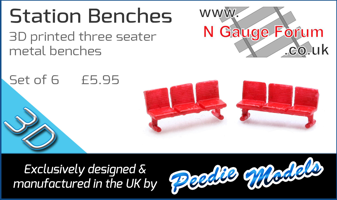 But it is still over-scale - shorter than the LNER group standard tenders, but longer than scale. I'm happy to put up with that compromise for keeping the drive mechanism that works well. 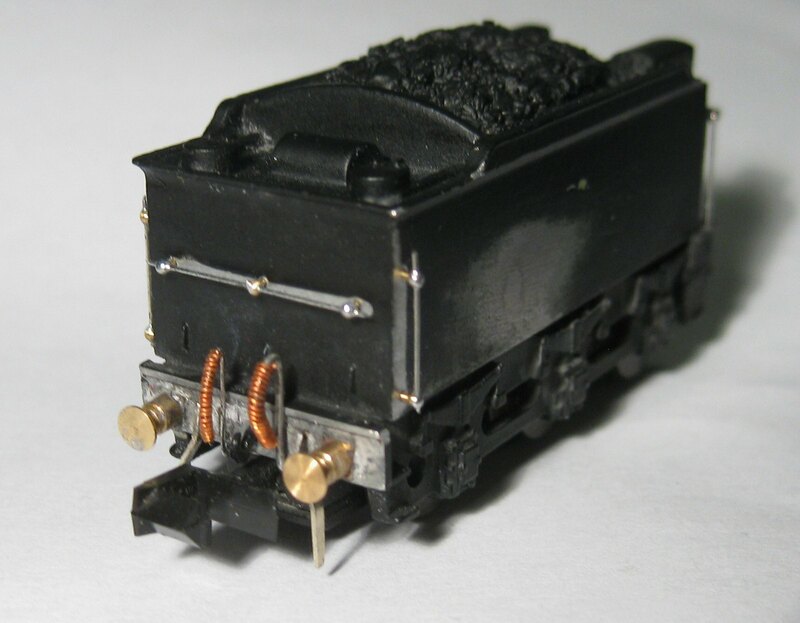 I think the tender drive unit (not the tender top) may be from one of the GCR or MR/LMS locos he has released; its certainly closer to scale than the Group Standard one it originally came out with, but as Dr. Alan says, it is still well over length and probably height. I've replaced my original tender drive with the newer one, and it does look better. Despite being a bit over scale I may have to see if Colin has the odd spare or 2 Cheers guys. I briefly toyed with the idea of cutting two 1mm sections out of the UM GER tender body and then soldering it back together to bring it closer to scale length. Something similar could be done with the tender chassis as well. Needless to say, I bottled out! I don't think it's ultimately possible to use the UM drive in a shorter tender - if it were, Colin would have done it, as this length wheelbase drive is unique to this tender. It's not worth trying anything IMHO - I'm happy to have the compromise - pragmatically it's not always possible to have things scale - the key is having the character of the loco I think - and this tender is pretty accurate in terms of detail - it does look a lot better than the generic (and completely wrong for this loco) later group standard tender. I think it could be possible if you fit a smaller motor (810 flat can) but it would be an awful lot of faff for a questionable/negligible gain. I agree that the UM GER tender works well with the locos and is considerably better than the GST that the B12/3 originally came with. Page created in 0.148 seconds with 43 queries.